This week's vintage jewelry find is by Mid 20th Century designer B. David. This designer produced high end jewelry with an abundance of aurora borealis rhinestones. The set featured here is just perfect for fall. 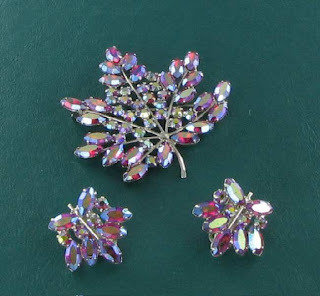 It consists of a pretty maple leaf design with meridian blue prong set aurora borealis rhinestones. There is a brooch and matching pair of clip back earrings included in the set. Stunningly plated in rhodium, this set is pure high end design. For more details and close up photos of this pretty B. David rhinestone set, please visit my store at Vintage Jewelry Lane. Priced at $95.99, it would make someone a lovely Christmas gift.